Friday food is a weekly article about one of the more unusual food items to be found in Liuzhou that week. Week 5 covered the fresh mushrooms then available in the markets and supermarkets. This week we look at some of the dried varieties. These are, of course, mostly available year round. 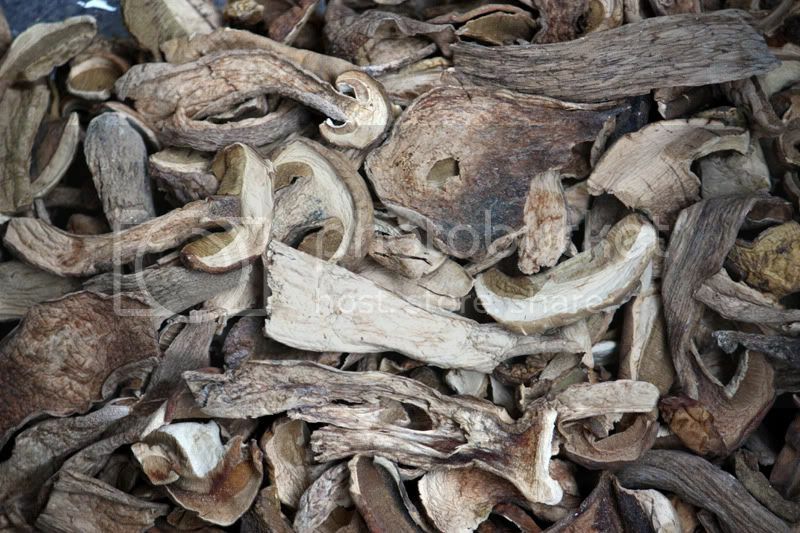 The widest selection of dried fungi is to be found, not in the supermarkets, but in the traditional Chinese medicine pharmacies. They are believed to cure almost everything and some, such as ganoderma, are being seriously investigated by western scientists for their alleged anti-cancer properties. Here I’m only going to consider the mushrooms sold for their culinary qualities rather than medicinal. 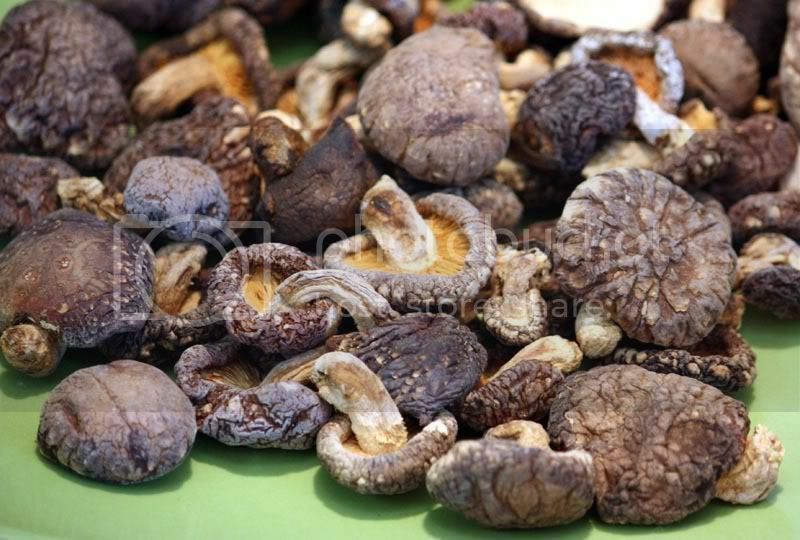 First up, just as shiitake mushrooms are the most common fresh mushrooms, they are also the most common dried mushroom. The most common name for the dried variety is 冬菇 dōng gū, or ‘winter mushroom’ (so-called because they are picked in winter). They should be soaked in very hot water for about twenty to thirty minutes before use. Remember, to save the soaking water as it will now be full of the flavour of the mushrooms. It can be used in soups, stews etc for extra umami. There are several sub-categories of dried shiitake mushrooms – the paler ones with cracked tops attract the highest prices. These are known as generally 花菇 huā gū, which means “flower mushroom. The taste of the dried variety is usually stronger than that of the fresh. The drying process seems to intensify the flavour and scent. When buying them, I always smell them. The stronger the scent, the better the taste. Dried shiitake are available in all Liuzhou supermarkets, but if you ever get the chance to visit markets in the country side around Sanjiang, try to find the mushrooms they have there. Picked from the wild and dried, they are fantastic. I’m fortunate to have a friend from Sanjiang who brings me regular consignments. I can smell her coming! Next we have these odd looking fellows. The monkey head mushroom (Hericium erinaceus) (also called lion’s mane mushroom, bearded tooth mushroom, bearded hedgehog mushroom, pom pom mushroom, or bearded tooth fungus. In Chinese they are 猴头菇 hóu tóu gū and are commonly used in soups, but can also be deep fried or sautéed. Monkey head mushrooms are white when fresh, but darken to a brown color when dried. They are very occasionally available fresh in markets, but more usually found dried. Again they should be soaked for 20-30 minutes before use. 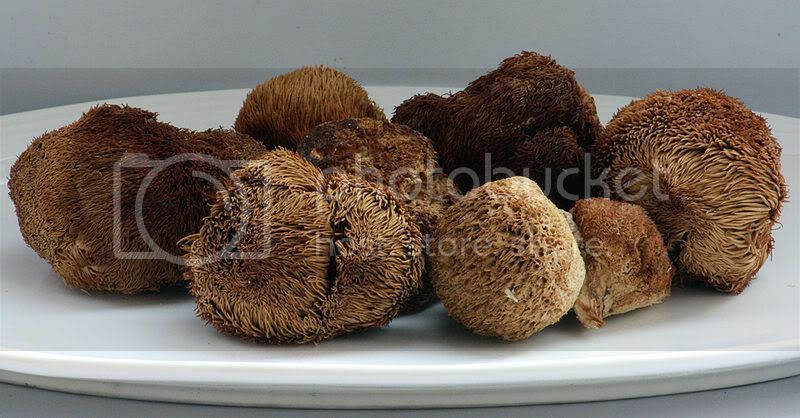 Because of their meaty texture when fried, these mushrooms are used in Chinese vegetarian dishes to replace meat. When boiled in soups they are spongy and tasteless, but prized for their texture. They are sold at around 68元 for 500g, but that is a lot of mushrooms. Bags of around 150g are more than most people would need in a year. 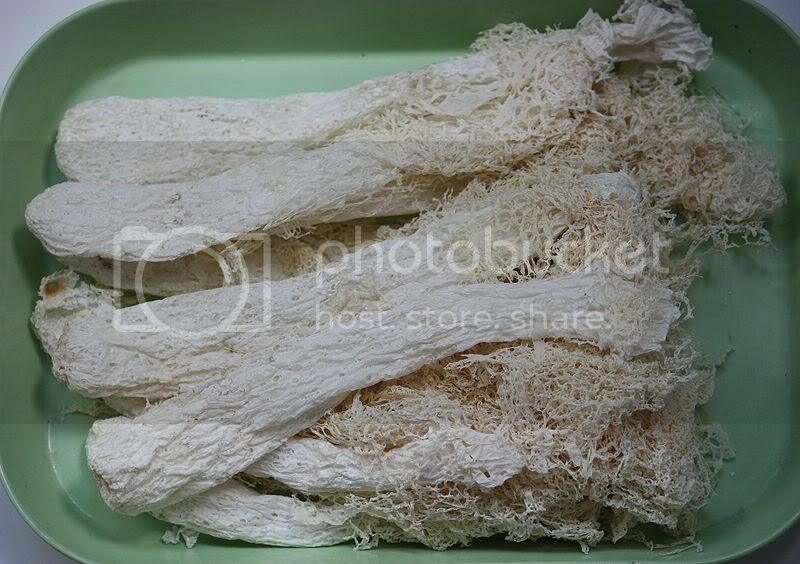 Then we have bamboo pith fungus, also known as bamboo fungus, bamboo pith, long net stinkhorn, crinoline stinkhorn or veiled lady, the last three names alluding to the lacy net like structure which hangs from below the cap. Until 1979, bamboo pith fungus was only found in the wild and then rarely, so was highly prized. In 1979, commercial cultivation began in Fujian province. The fungus is sold dried and requires soaking in hot water for around fifteen minutes before using. 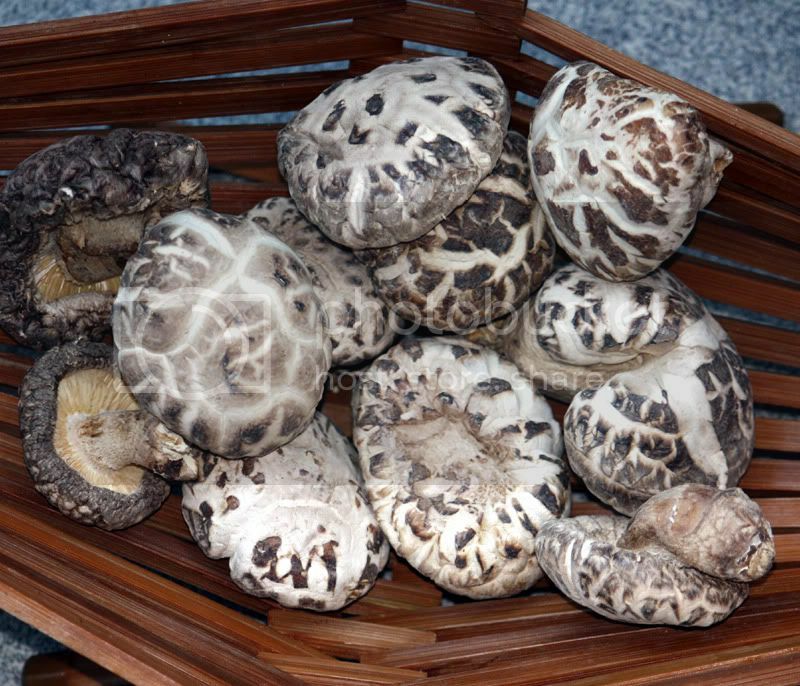 Known locally as 竹荪 zhú sūn, the fungus can be used in stir fries, but is more traditionally used in rich chicken soups. These do seem expensive. I’ve seen them priced from 250 to 280元 for 500g, but they are feather light. Bags of the mushrooms are sold at around a more sensible 20-30元. These will last a while. Then comes my favourite. 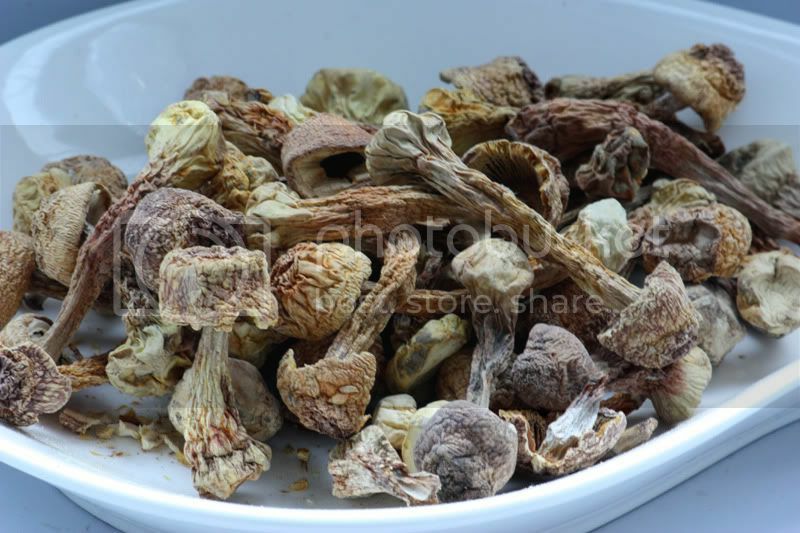 Agaricus subrufescens or 姬松茸 jī sōng róng, also known as almond mushroom, mushroom of the sun, God’s mushroom, mushroom of life, royal sun agaricus, himematsutake. These are lovely, but unfortunately not so common. They only place I know of which currently stocks them is RT-Mart (大润发) in the north of the city. They are 128元 per 500g, but again 500g is a lot. It came to 17.40元 for those in the picture. As usual, they should be soaked in hot water before use. They are slightly sweet with a delicate almond flavour and are delicious in stir fries, or with fish. RT Mart, in the north of the city, is stocking dried Boletus edulis, also known as cèpes, penny buns or porcini. These are the kings of all mushrooms. Known in Chinese as 牛肝菌 niú gān jùn, which literally translates as beef liver mushroom, these can be used in soups or stir fries, with pasta or in risotto (if you can find risotto rice) or in omelettes. Soak for 20 minutes in hot, not boiling, water. And remember, the soaking liquid will be full of flavour, too. Don’t throw it away! 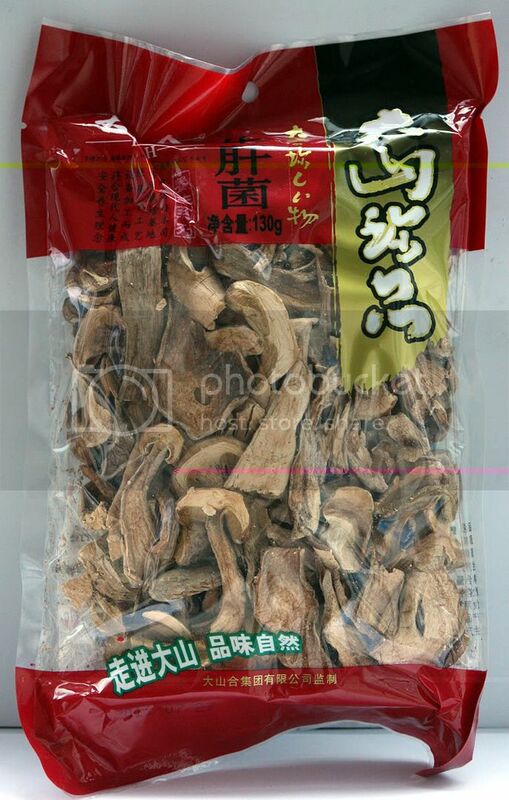 The mushrooms come in 130 gram bags (pictured below) which cost 39.80元. Again, it sounds a lot, but 130g will go a long way.
. This entry was posted on Friday, December 30th, 2011 at 10:00 am	and is filed under Food and Drink, Friday Food. You can follow any responses to this entry through the RSS 2.0 feed. Both comments and pings are currently closed.